Something a bit different has arrived! The Museum was thrilled to recently be generously donated a superb condition 1941 Norton 16H Despatch Rider’s motorcycle. In magnificent and mostly original condition, it boasts a 490cc sv single engine (side-valve, single piston) to produce an estimated top speed of 60 mph, albeit thirsty on fuel at 50 miles per gallon. 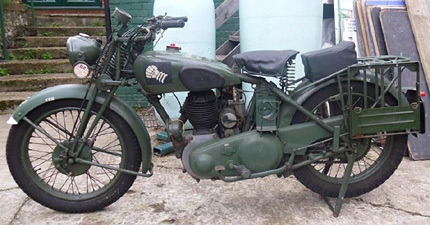 The paintwork depicts unit badges of the Royal Armoured Corps and the Museum would be delighted to hear from anyone who might have original items like the saddle to help further complete the wartime look of the motorcycle. We would also like to hear from anyone who might have authentic despatch rider clothing. Meeting veterans who were it not for them, there would never have been a Queen’s Diamond Jubilee. 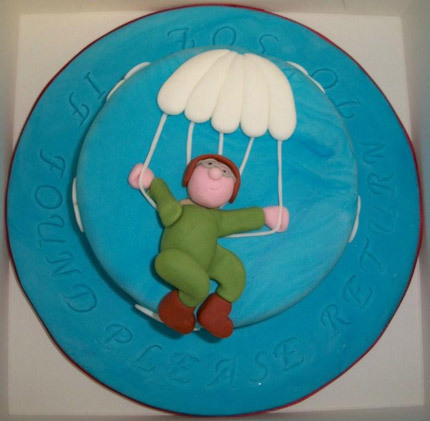 As always it was a pleasure to welcome SOE veteran Harry Verlander and his dear wife Liz to Shoreham and as a surprise thank you to Harry, he was presented with a wonderful novelty cake depicting Harry (the icing man) parachuting into Occupied France in 1944. Added to Harry’s novelty patriotic Jubilee hat, it brought a smile to many a visitor’s face who came along to meet him. 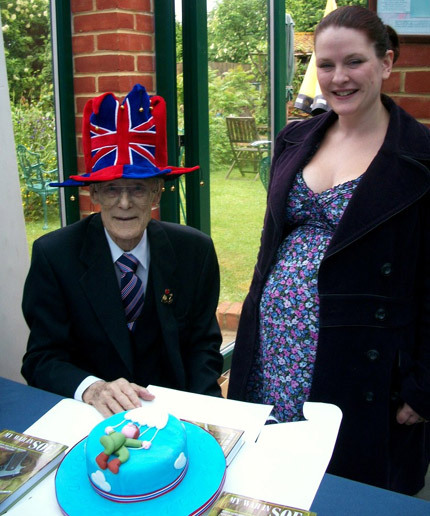 Thanks are due to talented cake-baker Niki Smith (seen here with Harry) who made the cake and she delights in making novelty ones (Dr Who themes are a specialty), so for anyone interested in contacting Niki about her novelty cakes, then please get in touch with the Museum. It was a very special privilege to be able to welcome to Shoreham, eight RAF veterans from Fighter, Bomber and Coastal Commands. 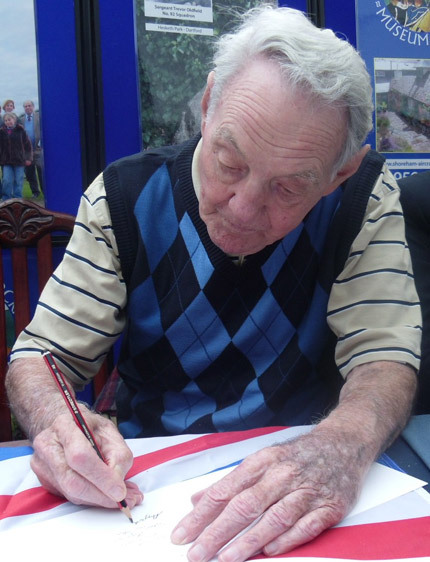 To meet and chat with visitors of all ages were Jack Christianson, Sid Beaver, Rodney Scrase DFC, Bertie Bardell, Sam Brookes, Joe Cook, Brian Cooper and Les Brilliant. Thanks to their excellent efforts, well over £400 was raised towards Museum projects and the RAF Benevolent Fund. Not to be outdone, the Fleet Air Arm turned up in the form of a surprise visit by Hugh McEnery, a veteran of the War in the Pacific and the Korean War. He flew classic naval aircraft like the Seafire and the Corsair and survived Kamikaze attacks against his carrier HMS Illustrious. He served with 802 Squadron on HMS Ocean during the Korean War and survived a perilous ditching in the sea. 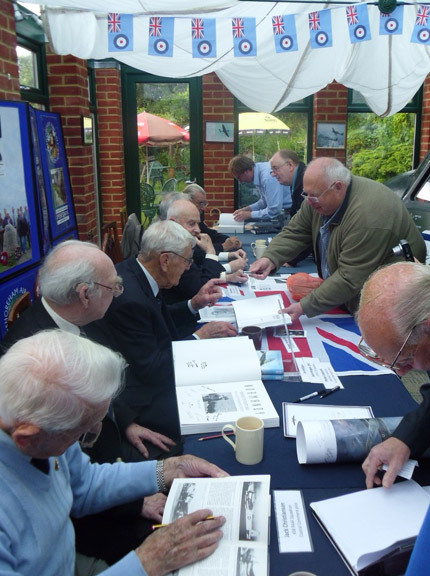 Look out for future signing events to enjoy the special opportunity in meeting veterans like these who are only too happy to share their incredible stories. You are currently browsing the Shoreham Aircraft Museum – News archives for June, 2012.